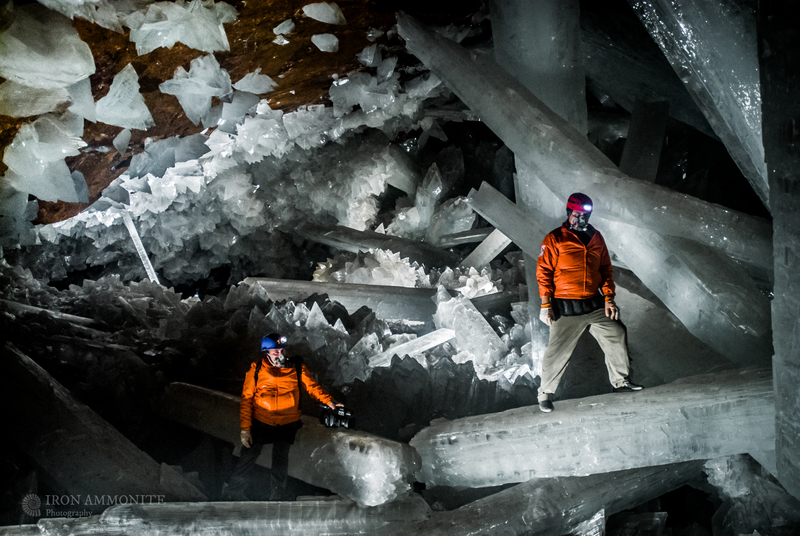 Deep inside a Mexican cave, there are larger-than-life spikes of crystals growing all over the walls. Microbes live inside these crystals, and if they’re able to survive the cave’s extreme environment, it’s possible that some of Earth’s life can survive in the harsh conditions of exoplanets. These findings can help us better understand how microbial life evolves, according to Penelope Boston of the NASA Astrobiology Institute. On Feb. 17, Boston presented her findings on these microbes at the American Association for the Advancement of Science Annual Meeting. “All of the work we do in NASA and the greater community, looking at extreme environments is really an understanding for pushing our understanding of the life,” Boston tells Inverse. These microbes in the Dave of Crystals in Chihuahua, Mexico thrive on chemicals like iron and sulfur and can survive in extremely high temperatures. And although they’ve likely been trapped inside these glittering crystals for 10,000 to 50,000 years, they’re still active. If these findings are verified, it shows that microbes on Earth can survive harsher conditions than previously thought. The fact that these microbes can survive in these habitats can help scientists map out how they will search for extraterrestrial life. “These caves are unlikely to be like features we find on other planets, but it shows these organisms can tolerate very extreme conditions and prosper,” Boston says. In addition, since the organisms seem to be active after thousands of years, Boston says it’s possible that either these microbes can be inactive for long periods of time, or get by on small amounts of energy. Right now, scientists cannot verify which explanation is correct, but this is still significant for the possibility of life in space. For example, unlike Earth, Mars experiences super seasons because it tilts back further on its axis than Earth does. If there was life on Mars, scientists could consider the possibility of organisms being able to stay inactive during these extremely hot or cold super seasons, similarly to how some mammals hibernate in the winter. “One of the greatest aspects besides the way organisms make a living are we believe we have seen strong evidence of extreme organisms being trapped in crystals for a significant amount of time,” Boston says. What’s more, these microbes survive not by eating organic material, like animals do, but by transforming inorganic materials like sulphur and iron compounds into food. Boston found these microbes were active when she took samples from the crystals in 2008 and 2009 and was able to “wake up” the microbes. She was originally looking for microbial fossils. “When I got the materials back to my lab and allowed things to grow, much to my surprise, the materials seemed to be growing organisms, and it was very tantalizing, but I was very cautious,” Boston says. Later, she was able to confirm these were indeed living organisms. These microbes are genetically distinct from other organisms on Earth, but most similar to microbes in volcanoes and caves. That being said, it’s possible these microbes didn’t come from the crystals, but from the pools or water nearby. Boston plans to make these crystal samples available to scientists who want to conduct further research on them. Since some microbes on Earth can survive such extreme conditions, Boston says NASA must make sure to sterilize the spacecraft to prevent bringing invasive life to other parts of space. This would also prevent us from mistaking life on Earth for extraterrestrial life.